It is a Water Soluble. For better & profused root development. White roots are the primary carriers of nutrients from the soil to the plant. 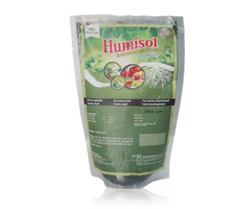 Humisol enables rapid development of white roots resulting in faster growth. Granular Formulation Humisol can be used over a long period of time and can over come leaching effect due to excess rainfall. Grapes, Citrus, Apple, Vegetables, Watermelon, Onion, Cabbage, Cauliflower, Green peas Capsicum, Pomegranates & Papaya.